When she was in her early 20s, Nicole Veum says, she made a lot of mistakes. "I was really sad and I didn't want to feel my feelings," she says. "I turned to the most natural way I could find to cover that all up and I started using drugs: prescription pills; heroin for a little bit of time." Veum's family got her into treatment. 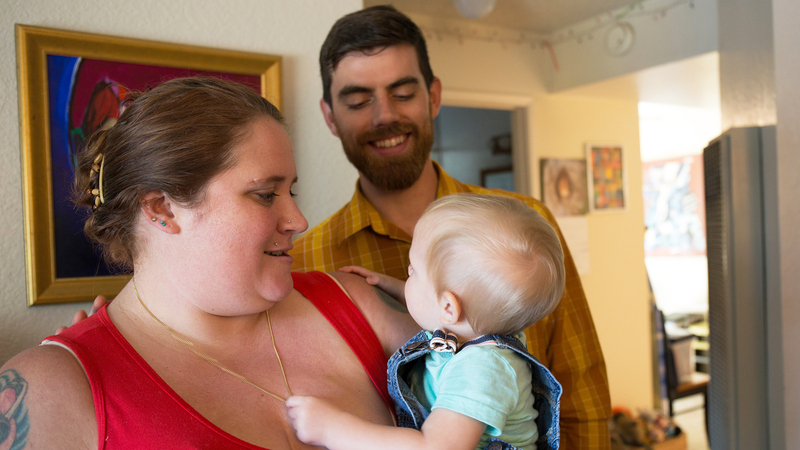 She'd been sober for nine years when she and her husband, Ben, decided to have a baby. Motherhood was something she wanted to feel. If she needed an epidural during labor, Veum told her doctor, she didn't want any fentanyl in it. She didn't want to feel high. "I remembered seeing other friends," she says. "They'd used it, and they were feeling good and stuff. I didn't want that to be a part of my story." An epidural is a form of regional anesthesia given via an injection of drugs into the space around the spinal cord. It's usually a mix of two types of medication: a numbing agent, usually from the lidocaine family, and a painkiller, usually fentanyl. The amount of fentanyl in the mix is limited, and little passes into the bloodstream, anesthesiologists say. But if a woman doesn't want the fentanyl, it's easy to formulate an epidural solution without it. Doctors either use a substitute medication or boost the concentration of the numbing agent. "There's no medical reason why someone should be forced to be exposed to opioids if they don't want to," says Dr. Kelly Pfeifer, a family physician and addiction expert who now works as director of high-value care at the California Health Care Foundation. Pfeifer says there's another situation to be aware of: pregnant women who are taking methadone or suboxone to manage opioid addiction. During labor, anesthesiologists often prescribe certain narcotics to help manage pain, but some of those commonly used — like Nubain — can immediately reverse the effects of methadone or suboxone. "Suddenly, you're in the middle of labor — which is already painful — and now you're in the middle of the worst withdrawal of your life," Pfeifer says. For Veum, it was the worst wildfire in California's recorded history that interrupted her birth plan. She and her husband live in Santa Rosa, Calif., and she was in active labor when devastating fires ignited nearby on Oct. 8, 2017. What are now known as the "Wine Country wildfires" burned more than 5,000 homes and killed 44 people. "There was a ton of smoke in the hospital," Veum says. "Like you could visibly see it outside — and smell it." Nurses told her everybody had to evacuate. Veum was transferred to another hospital, 5 miles away. And the special instructions for her epidural got lost in the chaos. "Then, when they went to change the drug, I saw the tube said Fentanyl on it," she remembers. "And by that point I was starting to feel 'the itchies' " — one of the familiar physical signs she would experience when starting to get high. Most women without a history of addiction wouldn't experience these sensations when given opioid anesthesia, says Dr. Jennifer Lucero, chief of obstetric anesthesiology at the University of California, San Francisco Medical Center. Anytime a woman who is not in recovery asks for an epidural without fentanyl (usually out of the mom's concern for the baby), Lucero explains why it's there. The fentanyl allows the anesthesiologist to balance out the numbing agent in the solution, she says, so women don't have as much pain from the contractions, but can still feel the pressure and are able to move their legs a bit or shift in bed during labor. Once she explains the trade-offs, and assures women that the opioid will have no effect on their fetus, most of her patients opt to keep fentanyl in the epidural solution. But doctors have been trying to cut down on opioids in other ways during labor and delivery, namely in what they prescribe for pain after the birth. For years, women who had a normal, vaginal birth were sent home with a 30-day supply of Norco, Percocet or another opioid, Lucero says. "Some people would think they're supposed to take them all," Lucero says, while other women "would not use it, and it would just be sitting in the bathroom cabinet." While most people who get a bottle of pills when leaving the hospital won't develop dependence or an addiction, some will. When a patient is prescribed opioids for short-term pain, the risk of chronic use starts to increase as early as the third day of the prescription, according to a 2017 report published by the Centers for Disease Control and Prevention. A 2018 study suggests that every week of opioid use increases the risk of misuse. As recently as 2017, postpartum women were routinely being prescribed three- to five-day supplies of opioids — even after an uncomplicated vaginal delivery. A study published that year of 164,720 Pennsylvania women on Medicaid who gave birth vaginally found that 12 percent of them filled an opioid prescription after they gave birth — even though most did not have a clear medical need for a painkiller, such as vaginal tearing or an episiotomy. Now obstetricians are issuing new guidelines to patients, Lucero says, and they're trying to prescribe limited amounts of opioids, and only post-surgically, to women who have had a C-section. Nicole Veum ended up being one of those women. After she was transferred to the second hospital during the wildfire evacuation, she spent another 12 hours in the early stages of labor, but it didn't seem to be progressing much. She agreed to a C-section. After the birth of her son, doctors sent her home with a bottle of Percocet — another opioid. They told her that if she was worried about being able to maintain her sobriety, she could have her husband or a friend hold on to the bottle and control the dosage. Pfeifer, the physician and addiction specialist, says that in a situation like that, sending Veum home with just a few Percocet pills, or even suggesting she take just take ibuprofen would have been fine. "Any parent will tell you there's nothing more stressful than the first week of being a parent and having a baby and being in sleep deprivation," Pfeifer says. "And here you have a little bottle of Vicodin that you used to turn to, to make you feel better when you're stressed." First the fires. Then the fentanyl in her epidural. Then the Percocet. It was Veum's first test in seeing how her sobriety and motherhood would line up. She called a friend who was also in recovery. They talked it all through, and Veum was fine. "I was OK. I was OK with it. It was just something that happened," she says as her baby, Adrian, now a year old, plays with a new toy. Veum is 32 now. She's returned to school this fall to work toward her college degree, after a 14-year break. And she is loving being a mom. "A lot of people, metaphorically, felt it as a baby coming out of the ash — the life coming from the ashes," she says about her child born in the midst of the 2017 wildfires. "And I feel that," Veum says. "I feel like it was a big time for our community — and me personally — to be reborn in some way."